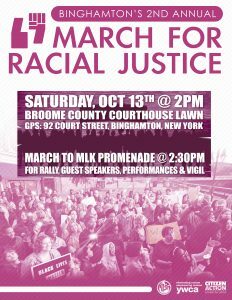 Saturday, October 13th, join us for Binghamton’s 2nd Annual March for Racial Justice—a follow-up to last year’s widely attended national #M4RJ racial justice march. This year’s theme is “Black Women Lead” and we plan to highlight and expand upon the tangible anti-racism work being done right here in the Southern Tier. We will have speakers from a variety of social justice orgs and entities, musical and spoken word performances from local artists of color, opportunities to volunteer and learn how to dismantle white supremacy and all forms of oppression in our homes, schools, workplaces, and communities. All of these incidents demonstrate the importance of taking a pro-active and assertive stance against white supremacy in our communities.